Not to be confused with Darkglare or Greater beholder. An observer in the TCG. For the warlock minion, see Observer (warlock minion). Observers are an intelligent race of floating eyeball squids native to the Great Dark Beyond. Looking through the Twisting Nether, observers have the capability to see through forms of stealth and invisibility. "It is the way of the Observer to bear witness to all things that come to pass." A plated crest covers the observers' forehead and top of the head. Gills are present in both sides of their bodies; below them, ten tentacles hang down. There's also an sphincter on their backside that can be seen contracting when observers fight and dilating when they die. When Observers fall asleep or die, they will fall to the ground. Adult members of the species feature two rows of teeth and seven eyes. Their eyes can shoot magic beams, with different types of magic coming from different eyes. Young observers only have two big teeth and a single eye that can shoot magic. They are also far less aggressive than their adult counterparts. There are also examples of floating eyes using poison-based attacks, like Broggok. The observers express a deep desire to bear witness to all forms of magic and are willingly offering their services in exchange for the opportunity to consume new forms of magic. Some observers have joined the Legion, but nothing suggests that the race is a member of it as a whole. Other individuals, including renegade demons like Culuthas, have gained the allegiance of observers to their own ends. There are also examples of observers that pledged allegiance to no one but themselves, like Xeleth who was worshiped as a god by Zangarmarsh's native creatures. Some observers joined the Illidari, among which some have stayed around Outland despite and since Illidan's death. The ritual to summon an observer is complex. They are highly migratory and the summoning ritual must compensate for their travels. Without their willing assistance, summoning an observer would be nearly impossible. During her journey to Outland, the undead warlock Jubeka Shadowbreaker learned from the observers the above-mentioned ritual and transcribed it to one of her grimoires. The tome was later sent to Azeroth and its information spread among the members of the Council of the Black Harvest. An observer called Xhu'daggab was summoned by the Horde forces under Ga'trul to watch the shores of the Jade Forest. Powerful observers have been spotted in the Blood Furnace, the Portal Clearing and in Twinspire Keep. Large groups were present in Blade's Edge Mountains, Shadowmoon Valley, Quel'Danas, the Black Temple, the Arcatraz and the Ruins of Farahlon under the service of different factions. [Sleepy Willy] is a possible reward from  Back to the Orphanage during Children's Week. [Cross Gazer] can be purchased from Orix the All-Seer for the cost of 1,000 Intact Demon Eyes. In Mists of Pandaria Observers became a new summonable warlock minion, available through the [Grimoire of Supremacy] talent, replacing the Felhunter minion. They are also known as floating eyes. Observers are called Beholder in the game files. 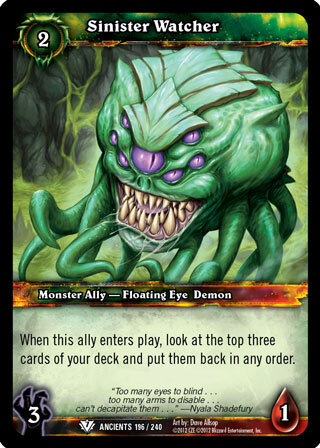 The name "beholder" also appears on eyes dropped by one of these creatures named Collidus the Warp-Watcher ( [Crimson Beholder Eye], [Fiery Beholder Eye], [Emerald Beholder Eye], and [Amethyst Beholder Eye]) and an item from Moragg ( [Shoulderplates of the Beholder]). Blizzard developers have also been known to use the term in interviews to refer to observers, suggesting it may be the more common term within the company. They vaguely resemble (and formerly got their name from) Beholders of Dungeons & Dragons fame, and are also similar in design to Cacodemons from Doom, as well as Octobrains from Duke Nukem 3D. A creature with a similar name, Cacodaemons, was found in Appendix three of the Manual of Monsters. Though appearing like them, Shirrak the Dead Watcher and Durumu the Forgotten are not observers. Shirrak is an undead creature created by Exarch Maladaar, and Durumu is an aberration created by Lei Shen's sorcerers. Floating Watcher is a observer in Hearthstone: Goblins vs Gnomes. Patches the Pirate an observer pirate in Hearthstone: Mean Streets of Gadgetzan. Xol the Unscathed, a female observer in Hearthstone: Kobolds & Catacombs. The observers under Culuthas can sometimes be seen shooting magic beams into the ground. The reason for this is unknown. It is possible that he is using the observers to excavate Farahlon. ^ PC Gamer - The two-year making of Hearthstone’s Patches the Pirate (2016-12-15). This page was last edited on 13 September 2018, at 00:54.